I want to salute all those who raised children before television was invented. Those are the real parents. I don’t know what parents did back then. No matter how good a parent you are, there eventually comes a time where you just need 30 minutes to get stuff done, and TV is the perfect solution. When I set my son in front of the TV for a few minutes, he really likes to watch Curious George. If you don't know, the eponymous Curious George is a little monkey who lives with a guy who has no other name than “The Man with The Yellow Hat.” Curious George is similar to a young child in that he is always curious and it frequently gets him into trouble. 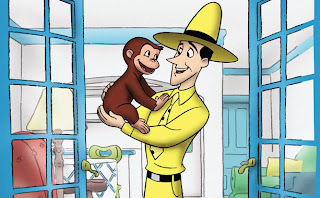 What irritates me about Curious George is this: The Man with The Yellow Hat is annoyingly patient. In every episode George innocently wreaks havoc and generally makes TMWTYH’s life a waking nightmare. However, at the end of each episode TMWTYH inevitably says something like, "It's ok George, I know you were just trying to help. It's ok that you flushed all your toys down the drain, flooded our apartment and our whole building, and the plumber had to come out three times. The plumber's bill and the bills for all the water damage in our apartment and throughout our building are going to cost me a fortune and I don't really seem to have a job, but I know you're just being curious." He never yells. He never raises his voice. He never sends George to time out. He never even gets frustrated. The most reaction Curious George ever gets out of TMWTYH is a gentle sigh and it drives me insane. I dislike TMWTYH so much because I wish I could be like him and have infinite stores of patience. He is the ideal parent and I hate him for it. TMWTYH also seems like he'd be a drag to be around at school functions or parties. All the other parents would be griping about their kids and he’d just be like, “You know, they’re just exploring their world and I think it’s wonderful blah blah blah.” That’s why TMWTYH spends his time exploring the jungle because no adult wants to be his friend. Nobody likes to be around somebody who is unflaggingly patient and optimistic. They make you feel terrible.